Philadelphia will soon have a lot more local liquor — and the tasting room to go with it — courtesy of a whiskey-soaked partnership between two of Philadelphia’s most prominent distillers. 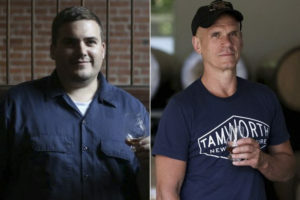 New Liberty Distillery’s Robert Cassell and Quaker City Mercantile’s Steven Grasse have teamed up for a partnership that will bring significant changes to Art in the Age of Mechanical Reproduction’s Old City storefront an d New Liberty’s Kensington tasting room, along with the distillery’s line of Kinsey Whiskey. Plus, the pair will release a new liquid offering every 30 to 60 days starting in the near future. This spring, that bromance will lead to a conversion of Quaker City’s Art in the Age from a retail storefront to a liquor-focused tasting room and one-stop shop for home bars. The shop will serve as a satellite location for Cassell’s New Liberty Distillery products, thanks to a provision in House Bill 242, a 2011 directive that allows distilleries in the state to operate two off-site stores to sell their products. The forthcoming tasting room will carry New Liberty products, as well as any liquids that come out of Cassell and Grasse’s partnership. Additionally, Cassell says AITA will host drink-making workshops, and will have all the ingredients for the featured drinks available for purchase. The QCM founder expects the changeover to arrive vin March or April, pending final approval from the Pennsylvania Liquor Control Board. Similar, though less drastic, changes will also come to New Liberty’s Kensington retail space, Grasse says. That building will soon serve as a space for hosting events along with being a tasting room and retail outlet. Those liquid collaborations will be released every 30 to 60 days, beginning with the pair’s Pennsylvania Dutch Malt Whiskey, which will hit liquor store shelves soon. The whiskey is a particularly Pennsylvania product, thanks to malt from Chester County’s Deer Creek Malt House. Cassell and Grasse contacted the company to get a traditional “Munich” style malt for the whiskey, which results in a deeper, more complex flavor when compared to other contemporary whiskies. The whiskey will feature design from Reverend Michael Alan, who works frequently with Art in the Age. Quaker City Mercantile will extending that new direction in branding to New Liberty’s Kinsey Whiskey liquors, rebranding what the label has to offer, liquid-wise. The goal is to pay homage to the Kinsey brand’s long history, which began in Philadelphia in the 1870s, while imparting it with a “modern boldness” — a regard in which Grasse is an “evil genius,” Cassell says. Going forward, Quaker City Mercantile will also provide branding for New Liberty’s offerings, as well as for collaborative liquids released by the two companies.